With over 20 years of experience in the spa industry, we will help you choose the spa best suited for your needs and budget. We also carry swim spas, exercise spas, party vessels, pool tables and accessories and a full chemical store to keep your existing hot tub in soak-ready condition. Swim and Exercise Tub Benefits Swim like an Olympic athlete, or start slowly and work on your stroke technique and endurance. Swimming is a total body workout that has never been easier thanks to swim spas. Stressed out and tensed up? Need to unwind? Enjoy the relaxation benefits of warm water hydrotherapy in a swim spas jetted-massage therapy seat. Exercise hot tubs are aquatic multi-use gyms. Perfect for any age and fitness level, you can tailor your aquatic workout with less impact on your joints, tendons and bones. Some tubs feature aqua bikes and rowing bars so you can get more out of your aquatic workout. Native Roots is the most complete, year-round garden center in Southwest Colorado. 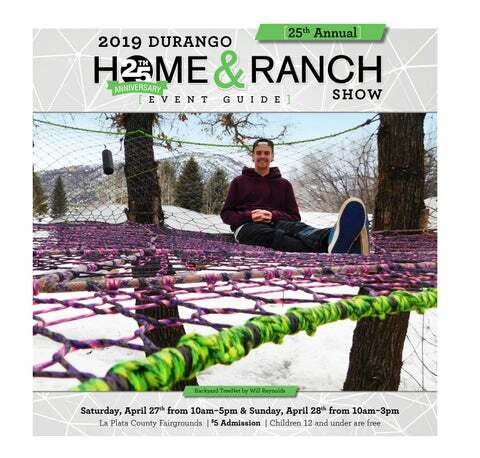 years have gone by since the first Durango Home & Ranch Show. Creator of the show Kay Ulwelling of Showcase Productions operated the show for 10 years. When Ulwelling moved out of state, The Durango Herald purchased the event. Since that time, the show, much like our region, has grown and changed while retaining its culture and character. Some of the biggest changes come in the form of innovation and advancements. Flat screens have replaced console TVs and wireless smart home systems allow homeowners to control the thermostat and lights from a smartphone while at work. Solar energy is more accessible than ever, and new technology such as drones, can improve efficiency on the ranch and take amazing aerial photos of homes and properties. There is also a growing wh en : focus on sustainability with more homes built Saturday, April 27 with recycled materials. Landscapers are more water conscious, using xeriscaping and new from 10 a.m.-5 p.m. techniques. Homeowners are attracted to Sunday, April 28 convertible furniture, and handy individuals use from 10 a.m.-3 p.m. wooden pallets in ways we never expected. With that sustainable mindset, tiny homes are more a dm i s s ion : the rage than the spacious mansions of the past. Adults $5, children But among those changes, some things have under 12 free stayed the same. Visitors can still browse a wide variety of vendors at the show’s original location, La Plata County Fairgrounds. And the show still takes place during the last full weekend in April. Some of our vendors, like Durango Nursery, Dietz Market, Louisa’s Electronics, Southwest Ag and many more, have supported the show since the beginning. And Four Corners Expos continues to support local nonprofits by offering subsidized space and partnering with organizations such as Habitat for Humanity, La Plata County Humane Society, The Community Foundation serving Southwest Colorado and the Women’s Resource Center. Finally, it is still the largest and finest home show in the Four Corners, showcasing so many amazing businesses. We hope to see you there. We offer free consultations in-home or at our local Durango showroom. PERSONAL SERVICE Locally owned & family operated, we provide personal & professional service. We donate 1% of our profits to customer recommended causes. his year, the sponsors for the 25th Home and Ranch Expo include a variety of businesses that serve the communities we call home. Four Corners Expos extends our appreciation to Durango Spas, United Rentals, Durango Thank you for Party Rental, The Durango Herald and Four your support! Corners Broadcasting for making this event successful. Without this support, it would be more difficult to organize and host the largest home show in the region. You can learn a little more about these businesses below. Smart Motorized Shades make your home more efficient, luxurious and offer next level convenience. 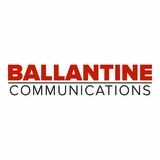 Automation & voice command capabilities. 305 S. Camino del Rio, Suite U, Durango (970) 739-7722 show location: 82-93 Courtyard, 133 & 135 Parking Lot hours: Monday & Wednesday-Friday 10 a.m.-5:30 p.m., Tuesday 4-8 p.m., Saturday, 11 a.m.-5 p.m. and Sunday Noon-4 p.m. The owners of Durango Spas bring 20 years of experience to the new locally-owned and operated business. Durango Spas connects its customers to a small selection of high-quality spas, as well as necessary chemicals and equipment to keep them clean. Browse a variety of spa models at the show this weekend at booths 82-93 in the courtyard, and 133 & 135 in the parking lot. 969 Highway 3, Durango (970) 382-2591 show location: Exhibit Hall 11-12, Courtyard 99-100, Parking Lot 143 hours: Monday-Friday 7 a.m.-5 p.m. Full team on call after hours. Whether upgrading your bathroom or tilling a garden, customers at United Rentals can rent tools and equipment necessary for all home and ranch projects close to home since 1993. United Rentals offers commercial lawn and garden tools, home remodeling tools, construction equipment and industrial services. Stop by any of the previously listed booths to meet the United Rentals team. 67 Suttle Street, Durango (970) 259-6009 Farmington (505) 327-7985 hours: Monday-Friday 8:30 a.m.-4 p.m., Saturday 8:30 a.m.-Noon Durango Party Rental has helped residents in the Four Corners host an assortment of amazing events for individuals, groups, nonprofit organizations and local businesses for over a decade. With the largest inventory of event accessories available for rent, the team can find the perfect fit for the party and the pocket. 1275 Main Avenue, Durango (970) 247-3504 show location: Extension Building 120A hours: Monday-Friday 8 a.m.-5 p.m. The Durango Herald is an award-winning news publication. It publishes articles online every day and a print newspaper every Monday, Wednesday and Friday, in addition to The Weekend Edition every Saturday. The paper includes local, state and national news, regional issues, entertainment news, community calendars, sports, opinions, columns, comics and classifieds. fm stations: KIQX 101.3, KKDC 99.3, KRSJ 100.5 am stations: KIUP 930 Four Corners Broadcasting adapts and grows to serve the communities in our region by broadcasting local news, local sports, ESPN talk shows, public service announcements and music around the clock. Today, the company reaches a range of audiences across four radio stations in southern Colorado and Utah, as well as northern Arizona and New Mexico. hen the interior and exteriors of our homes focus on what we value, our homes also increase in value. Spaces feel more welcoming when they are genuine reflections of the people who live there. But how can you make a space feel more like home? Four Corners Expo Coordinators Sharon Hermes and Abby Feldman work to create exciting events How can you that benefit both businesses and attendees. Together, make a space they host the largest home show in the region where visitors can talk with professionals about homes – their feel more build, design, maintenance, renovation, efficiency and like home? much more. The Home and Ranch Show offers attendees the opportunity to connect with experts to help others make the most of their space. This year, visitors can browse more than 90 vendors at the La Plata County Fairgrounds April 27 and 28. “We have vendors from around the Four Corners, and some travel from the Front Range,” Hermes said. “We also have a few national clients that travel from as far as Florida,” Feldman said. These vendors can consult with individuals, offer advice, demonstrate services, sell products and schedule future appointments with attendees. Some businesses may offer samples or additional raffles, so be sure to stop by each booth! The businesses invited year after year are able to meet the needs and desires of a wide variety of homeowners, landlords and renters in Southwest Colorado while keeping budgets in mind. Feldman said there will be cleaning companies, energy experts, lawn services, storage solutions, drone photography and much more. Attendees can shop for art, décor and furniture. They can also look into upgrading appliances, hire a professional for a renovation project, or find the perfect fire pit or spa for outdoor entertaining. Homes are more than a shelter. They are unique expressions of those who dwell there. If you want to make a house feel like a home, Four Corners Home & Ranch Expo has ideas, inspiration, innovation and individuals that can help you make your dream a reality. Largest Selection in Town! Plants Are Locally Grown. racks for storing belts, ties or scarves. Aspen Wall Wood Company will keep someone warm with the gift of firewood, and Atmos Energy aims to help other homeowners be more energy efficient by providing a programmable thermostat. Reflections in Metal will give away one piece of metal artwork perfect for display on the interior or exterior of the home. The list of prizes is large, but there are small benefits too. Donâ&#x20AC;&#x2122;t miss out on this opportunity. Guests can register to win these prizes and many more at the show near the entrance. Some of our vendors have special swag or other goodies available to guests at their booths, so swing by and say hello! “The best and worst part is always coming up with something new,” he said. “I hate making the same thing twice, but at the same time, it is hard to constantly come up with all these (new designs). It comes and goes in waves.” Reynolds said the time it takes to install a permanent TreeNet depends on the height off the ground, perimeter size and other variables with features and safety. With every installation, it is his goal to create a durable net without harming the trees. “I don’t use any hardware,” Reynolds said. “If you want to take it down in five or 10 years, there will be no remnants of it being there.” In addition to TreeNets, Reynolds builds DIY kits for personal SpaceNets. SpaceNets are designed as temporary nets rigged with ratchets or slackline gear. Reynolds will have special surprises at the show, including examples of his custom patio furniture and a net constructed in a trampoline frame. Find more information about Treenets and a portfolio of completed projects at www.treenetwillys.com. PROTECTION FOR WHAT’S NOW, AND WHAT’S NEXT. With our innovative and customizable coverage options, we’re here to protect your home—and your growing dreams. Let’s talk about your home insurance today. 35 La Plata Electric Assn. Durango Home & Ranch Show Sale! Limited time only. Come visit us at booth 32! Gutter Helmet includes a triple Lifetime Warranty against gutter clogs. Gutter Helmet is the First, the Best with 85+ million feet installed to date. Never clean your gutters again! BBQ Brisket Sandwich Served on a kaiser roll. All beef frank served on a white bun. Improving entertaining in the home ome homes are seemingly built for entertaining, while others may need a little help to make them more fit for hosting dinner, holiday gatherings or an evening with friends. Overall, one-quarter of people entertain guests in their home either daily or weekly across the globe. One-third entertain monthly, according to findings from GFK Insights. People who open their homes to loved ones may want to make some modifications to their spaces to improve the experience for all involved. n	Tame the clutter. Look for ways to reduce clutter in rooms where entertaining takes place. Built-ins with bookshelves and cabinets can hide electronics and wayward toys or collectibles. Focus attention on the entryway, hanging hooks for collecting coats, keys and shoes, so they do not overrun the foyer. Remove any knickknacks or other breakable items from shelves or on coffee tables to free up more space. n	Improve conversation seating. Arrange tables and chairs to create conversation nooks for guests who want to talk and get to know one another better. Consider moving out big and bulky sofas in favor of love seats or comfortable chairs that will take up less room and improve flow in entertaining areas. n	Find the pieces you like. Think about how you tend to entertain and then cater your space to those preferences. For example, a large dining table with fold-out extensions or leaves is ideal for someone who regularly hosts formal dinner parties. Renovate a room to include a small bar and club chairs for a lounge feel if cocktail parties are typical. People who open their homes to loved ones may want to make some modifications to their spaces to improve the experience for all involved. n	Improve lighting. Work with an electrician and/or designer who can offer ideas for lighting that can set the mood for entertaining. Rooms that are dull and dim can benefit from overhead lighting fixtures if there are none already available. Task lighting in the kitchen under cabinets can make it easy to prepare food for guests. Wall sconces or focused lighting on artwork can establish a dramatic effect. he way a home is designed can say a lot of things about it. In fact, many real estate professionals and contractors can determine when a home was built based on the design of its interior. For example, homes with sunken living rooms were likely built sometime in the 1960s and 1970s. Open concept living rooms are one trend that might one day make people nostalgic for Open concept the early 21st century. Many of today’s home floor plans buyers want homes with open concept floor which can give homes a more spacious continue to be plans, feel, perhaps even creating the illusion that a popular among home is bigger than it really is. Home buyers who have never before enjoyed home buyers and open concept floor plans can consider these benefits to these wildly popular layouts. might prove to be the most lasting home design trend of the early 21st century. Many people who live in homes with open concept floor plans cite their convenience when entertaining as one of their biggest assets. In an open concept home, guests don’t have to be corralled into a single room in the home. Instead, hosts and their guests can roam freely from room to room because there are no walls dividing common areas. This can make gatherings feel less cramped than in homes with more traditional floor plans. The safety of open concept floor plans may be most applicable to parents of young children. Open concept floor plans allow parents to keep an eye on their children while cooking dinner, working from home or tending to other chores around the house. Since there are no walls to divide rooms in open concept homes, parents don’t have to wonder what their curious kids are up to because they can see them at all times. Open concept floor plans give homeowners more flexibility. For example, homes with more traditional floor plans may have designated spaces for dining areas. These spaces don’t leave much room to work with and may not be valued by homeowners who don’t often host dinners at home. As a result, such rooms may just be wasted square footage. With an open concept floor plan, homeowners have the flexibility to make dining areas as big or small as they see fit and can even adjust the rooms on the fly on those occasions when people are coming over. Perfect Light. For Less. Innovative light-diffusing window fashions from Hunter Douglas turn harsh rays into a soft glow. Discover this perfect light and save with valuable rebates, now ‘til 6/24/19. Come by any United Rental booth to learn more about equipment sales, service, rentals and more! Look for us on the east side of the parking lot! Come see us at booth 37 & 38! Durango Parade of Home 1st Place award winner! Awards Winning Designs Call Kurt Will Today!